That exotic green, round, thing that falls down from the tall trees with a loud thud- the coconut. Exotic, because you can’t find it in a non-tropical country. And definitely not in areas with snow or any dramatic temperature drop. 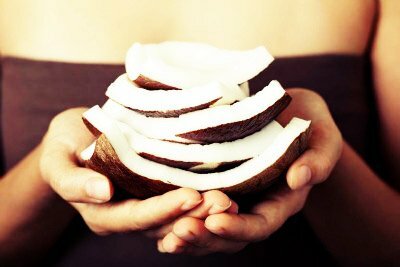 The coconut oil, an extract from the meaty, white part of the fruit, contains high saturated fat. Yes, coconut oil has saturated fats, but nobody bothered to ask which kind of coconut oil and which kind of fat. You might be thinking, wait a minute, if coconut oil has saturated fats, how come it can burn fat? The answer lies in its molecular structure. To make this science bit easy, imagine that fat can be short, medium, long, and very long. Coconut oil has the medium chained fatty acids. And the medium chained fatty acids are your best friend. They act like carbohydrates, so they don’t get stored nor do they circulate freely in the body. So where’d they go? They are directly sent to the liver and used as energy right away. The consequence of this is an increase in metabolism which is why it triples the normal metabolism rate. And because it doesn’t get stored nor does it circulate, it protects against cardiovascular diseases. Unfortunately, the primary medium chain fatty acid, lauric acid, is only found in virgin coconut oil. The refined coconut oil gets stripped of this and will not be able to give the same benefits. Lauric acid is responsible for most of the health benefits of coconut oil. The key thing to remember though is that it’s important to only use virgin coconut oil. Lauric acid is an antimicrobial agent and can balance blood sugar levels. It can kill disease-causing bacteria, inside and outside the body. For example, virgin coconut oil can get rid of dandruff, as this is caused by fungi. It can also help heal skin lesions. Virgin coconut oil can also control the rate of glucose synthesis and its release. This is done by slowing the digestive process and will keep the blood sugar level in a safe range. So, how do you exactly eat/drink coconut oil? Using it as your butter or cooking oil, is the most popular one. It can also be a substitute for butter or shortening in baking. If you’re decided to make the virgin coconut oil a part of your daily regimen, then take it as it is. Some take one teaspoon daily, others take them in capsules. As there is no recommended amount of intake yet, it is best to ask your dietitian or nutritionist for the best amount that suits your lifestyle and diet. I actually know a friend who’s been drinking VCO and she claims that it helped her lose weight organically after giving birth. At first I was really suspicious about her claims because it’s nearly impossible. She did lose a lot of weight but she also breasfeeds, which obviously burns fat faster than any other workout. A teaspoon of coconut oil doesn’t seem too gross since it’s not much. But since it’s oil, I’m wondering if drinking cold water after drinking it will make my throat feel weird? I tried this before since it really became a trend. It didn’t do much for me since I’m already in a normal weight and my goal was just to lose a couple of pounds that I could still lose, but nothing happened. It depends on the person. It worked okay for me and I lost a significant amount of weight. Is this safe for all ages? This sounds disgusting. I’ll cook with it, sure. But I dislike the taste of it alone. I’m a coconut oil lover. I swear having a tub of it at home is really amazing. You can use it for a lot of things. Coconut oil tastes odd in cooking. I prefer normal vegetable oil for cooking. Same issue. It tastes a little coconut-y, but yeah. It’s coconut. ?